A couple of weeks ago, I’m wandering around in ‘Red Dead Redemption’. I was trying to finish up the story, you see, since I borrowed it a few months ago and I should probably return it to its rightful owner soon. But, as is always the case with that game, I only complete a few missions before I start ambling off the trail, looking around at the fantastic environment. As I’m thinking about how cool it is to wander through a game world with your character, my friend Andrew sends me a message over XBox Live, asking if I wanted to get into multiplayer mode. Social butterfly that I am, I said that of course I would. And I want to tell you that a solid multiplayer mode in a great sandbox game is an absolute gem of a time. So, we spawn at MacFarlane’s Ranch, and the first thing I do is, I get shot in the face by some bandito with a purple gamertag. One of the ones that goes “xX___x___Xx” or something. You know what I mean. Andrew gets shot about four seconds later—purple gamertag. Then I respawn and eat another bullet from the same person. It quickly becomes apparent that this hoss is bullying everyone in sight, with superior firepower and a horse that is PROBABLY equipped with lasers. Of course, I’m not a very good shot, and it looks like my friend isn’t faring too well either. Eventually, we ended up spawning far enough away from the centre of the ranch, running off into the hills, and jumping on our horses to get the heck out of Dodge. When we got to the next town, we high-fived. You know, through our headsets. Don’t judge us. I tell you this story not simply because it is thrilling (it is!) and not because I’m a great storyteller (I am! ), but because it’s a slice of life. A slice of gaming life. It’s the sort of scene that gets played out, in unpredictable ways, whenever you enter into a sandbox game with a bunch of other punks and you’re all left to your own devices. Here’s another example of the accidentally wonderful moments that can grow up around you. I haven’t played multiplayer in ‘Red Dead’ very often, but this has happened pretty much every time. Say you’ve got a bunch of players waiting in the lobby for a gang shootout to start. While you wait, you can run around the area, but you can’t use your guns. So what do all these players inevitably end up doing? Gathering in bunches and punching the daylights out of each other. Yes, the game lobby lets you punch each other, and yes, it is hilarious to watch a dozen cowboys and marshals and Mexican rebels brawling like a bunch of drunken… well, cowboys. Creating your own thing in an open-ended game is almost another game entirely. It’s something that’s particularly satisfying to do in a sandbox game, probably because the philosophy of a game like that is that the player should be free to do what he or she pleases with the world that’s been given to them. Well, if you’re going to put me in a city full of cars and ramps and helicopters, you can’t expect me to NOT try to re-enact that ridiculous scene from ‘Live Free Die Hard’, can you? Doesn’t matter. I’ve already tried. Haven’t succeeded yet. That’s probably because I need someone driving the car and someone holding the chopper in a low hover, now that I think of it. Well, that serves as an illustration of my main point: wreaking havoc in a sandbox game is fun alone, but better with friends. Two heads are better than one. Especially when they’re both mad geniuses. My friend and I once spent over an hour in “GTA: San Andreas” jumping out of planes and helicopters and trying to land in swimming pools. That felt like much more of an accomplishment than anything the storyline could throw at us. These departures from the rulebook can be spur-of-the-moment, or highly organized. Stories abound of dedicated guilds in ‘World of Warcraft’ who stage theatrical drama and epic battles. Famously, one group even held an in-game funeral for a fellow player who died in real life. Infamously, a rival guild stormed the funeral and killed everyone present. Controversial? Surprisingly so. Memorable? You bet it was. All I’m saying is that it can be fun to let yourself get creative in a video game, and see what you can get away with. Rather than just running from Point A to Point B, take the road less travelled. Or, if roads are too passé for you, use your grappling hook to fly there. 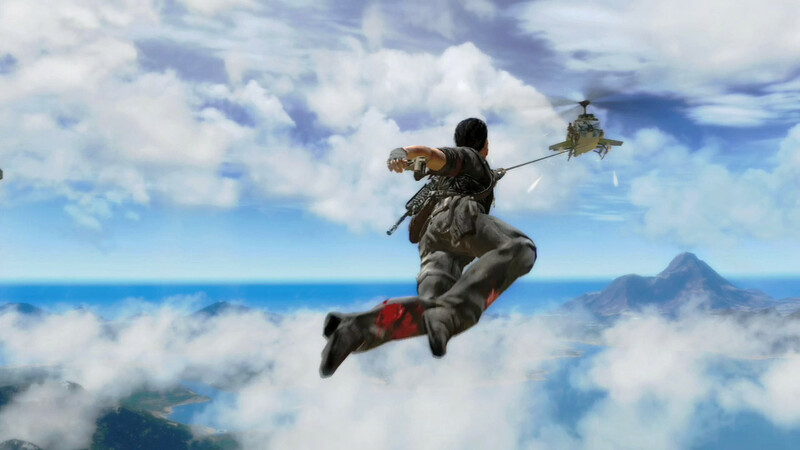 I’m lookin’ at you, ‘Just Cause 2’. There will always be limits to the things you can do in a video game. I mean, obviously, right? But those constraints can make for interesting interactions, too. When I play the XBox version of ‘Team Fortress 2’, the only thing I can make my character say is “Medic!” But if a Scout runs over to my dispenser, whacks it with his bat, runs to another spot, and jumps up and down screaming “Medic!”, I know he wants the dispenser over there. Trust me. I’ve done it before. It’s like teaching a horse how to samba. There’s a communication barrier, but if we put some effort in, it all clicks. Not to mention that teaching a horse to samba is guaranteed to make for a good movie. And at the end of the day, don’t we all need more movies about talented animals? Anyway, gamers, I hope you jump into a game with some friends (or strangers) and try something that isn’t in the instruction manual. In fact, rip up your instruction manual! Wait, I was kidding! Listen, even when the game tells you what to do, the sky is the limit. Once you know the rules, you can break them. Oh, Morpheus, will your wisdom ever let us down?